For news 2010, click here. Your club was treated to a talk on the work and operation of the Royal National Hospital for Rheumatic Diseases, affectionately know as the "Min" to locals. 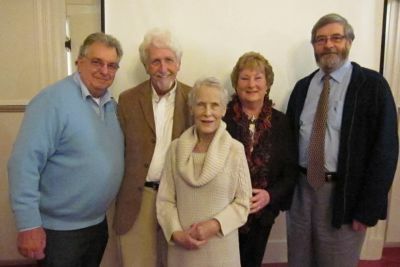 The talk was presented by three of the Governors of the hospital, Judy Coles, George Odam and Sue Meadows. The Governors are elected every three years and they have a responsibility to hold the Board of Directors to account and they represent the views of the patients, public and carers. The "Min" is probably unique in the way that it operates. It is a small hospital, and this feature allows the staff to know each other and this leads to cooperative and effective interworking of departments. Large hospitals, whilst offering excellent care, cannot possibly know all their staff and care can become depersonalised. Both Judy and George are patients at the Min as well as being on the board of Governors. The Talk was held at the Greenhill House, the Cheshire Home in Timsbury. We are very grateful to Fran Ashby for allowing us to use a room at the Home for this talk. 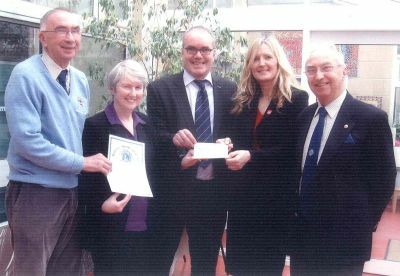 Photo: Lion Derek Y, George, Judy, Sue and Lion President Richard. Sarah-Lea Minshall has Cerebral Palsy. She is 24 years old and has been living at Greenhill House, Timsbury fo over 2 years. She has very limited speech and uses a communication aid called a Liberator which she works through a small dot on her forehead. Attached to her motorised wheelchair, this allows her a degree of independence. To ensure that this essential equipment is always available to her, and to avoid further expensive repair bills, insurance has been arranged. The cost of the first year's premium, £695, has been paid for by our Lions club. Photo: Welfare chairman, Lion Russell Ford, Lion President Richard, Sarah's mum, Billie, Lion Ray James and a delighted Sarah receiving the cheque to provide insurance. 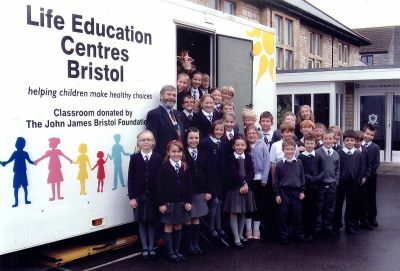 Every year, Life Education helps more than 16,000 children across the Bristol, South Gloucester and BANES areas to learn to make responsible life choices. By teaching them about diet, exercise and to manage the risks they may encounter growing up, they are helped to take responsibility for their own lives. Life Education makes learning fun, capturing children's imagination and ensuring the work is memorable. Using stimuli-richa nd interactive techniques such as puppetry and role play, they are taught about the cause and effect relationships of issues they may face as they grow up. Specially trained educators deliver the programme to schools in a high tech mobile classroom. Your club has sponsored the delivery of Life education to St John's Midsomer Norton for this year and for the following seven years. Photo: Lion President Richard, Teacher Laura Lamble and class 5L. Local lady, Rosina Guare is the third lady to be inducted as a member of our club in the last 12 months. 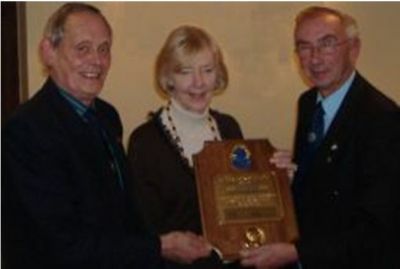 Lion President Richard conducted the ceremony, assisted by Lions Margaret Small and Phil Kendon, with Lion Barry Rogers who introduced Rosina to the Lions. 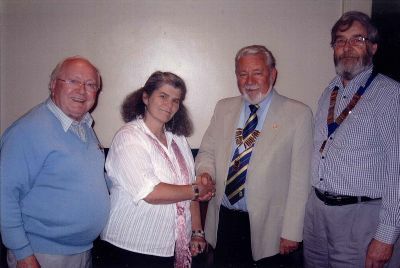 1st Vice District Governor, Harry Smith celebrated his club visit by presenting her with the Lions badge. Rosina comments "I am very happy to join the club which does so much for the local community. Helping others is what this club is all about and I am pleased to be inducted into this international organisation." New members, men and women, are always welcome. For more information contact our Membership Chairman, Lion Phil Hathway by . 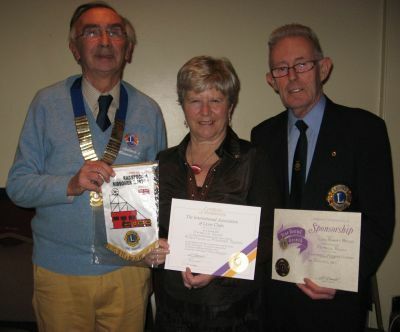 Photo: Lions Barry, Rosina, 1st VDG Harry and President Richard. 30th September: Mangledwurzels and Horizon Concert. Two local groups joined together for an evenings mixture of folk music and cider fuelled scrumpy and western fun. 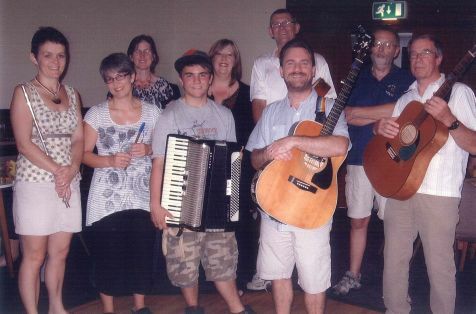 The groups entertained an appreciative audience at the Paulton Rovers Football club with their own brands of songs and music. The "Cider County of Somerset" was very evident in both performances. Horizon in the first half and Mangledwurzels in the second after a ploughman's supper. Horizon are an old favourite of the Lions and over 25 years have not lost their appeal. 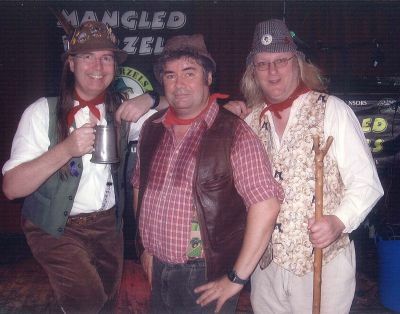 The Mangledwurzels are a three piece Scrumpy and Western band, based in Somerset, writing and performing in the style of Adge Cutler, and have established themselves across the West Country. Lion President Richard thanked everyone for their hard work and support, Horizon and the Mangledwurzels for their entertainment, Paulton Rovers Football Club for the free use of the Hall, and the bar and kitchen staff. Proceeds from the concert are being donated to local and international charities, helping others to a better future. September: Lion help Cancer Surgery. Mr John Waldron, consultant ENT surgeon at the R.U.H Bath, was presented with a reference book on Endoscopic Laser surgery of the upper aerodigestive tract. With special emphasis on Cancer Surgery by Wolfgang Stiener Petra Amrosch, this illustrated book, requested by Mr. Waldron, will be widely used in the ENT clinic. Social committee member, Lion Derek Yelling, presented the book. 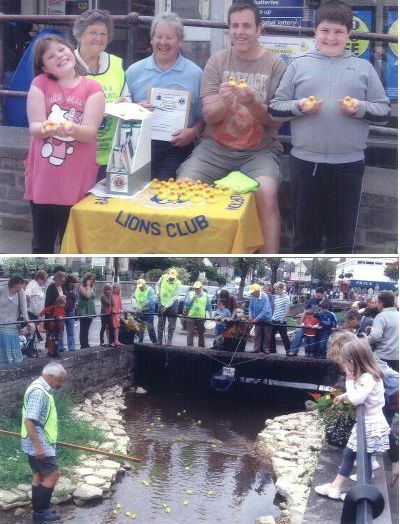 Our fifth annual duck race took place on Saturday. The route had to be shortened because a mother duck and her seven ducklings were occupying the finishing line outside of Martins! The race was run in three heats, with the first 25 of each group taking part in the final race. The winner was duck number 608 with 545 and 629 finishing second and third. Winners will be notified in the near future. Once again a very successful event, organised by Lion Alan, with the proceeds being donated to Lions local charities. Lion President Richard, thanked all those who had helped to make this event a success. Winners will be announced later. Top: Katy, Lion Margaret, Lion Terry, Dad, John and son Toby, showing our ducks. Bottom: The finishing line. Lion Tony encouraging the ducks, Lion Russell with the net whilst spectators look on. Final event of the year for Lion President Geoff Moore. This was held at the George, Nettlebridge. Grace was said by Lion Derek Livsey and the club then enjoyed a good meal and convivial company. The meal was followed by one of our quarterly 50 club draws. Lion President Geoff recounted his year of office and thanked club officers and members for the help that he had been given during the year. He particularly thank club secretary , Lion Alan and treasurer, Lion Hilton, without whom, he said, he would have been unable to fulfil his office. He was especially pleased that during his year, the club had gained its first TWO lady members and was looking forward to more joining the club. 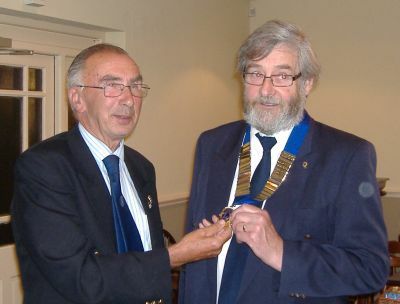 Photo, Immediate Past President, Lion Geoff, handing the chain of office to the new Lion President, Richard Munden. 6th June: Seniors Golf Competition, Farrington Golf Club. Monday saw our 8th Annual Charity Golf, Four Ball, Better Ball and Putting competition. Fine, warm and sunny weather produced score cards leading to a tight finish. Proceeds from the event this year will be donated to Paulton Hospital. The event was organised by Lion Derek Yelling, assisted by Lion President Geoff and for the first time, this year, included lady competitors. Grateful thanks to our hole sponsors, Whitstones, The Station Inn, Wheelers, Cameley Lodge, Davies & Way, Assure Property Rentals, Terry Taylor, Paulton Post Office, K Burchell Associates, The Haynes, Dando's Store, MG Edgell Motors, Richard Wood, The Butchers Arms, High View Garage, Imaging Equipment, Paul Gunstone, Premier Plumbing, George Neville Transport Safety, Ian MacDonald, Petherics & Gillard and Opal Print. Our thanks also to those individuals and companies who provided draw prizes and of course to Farrington Golf Club for the use of the course and club facilities. 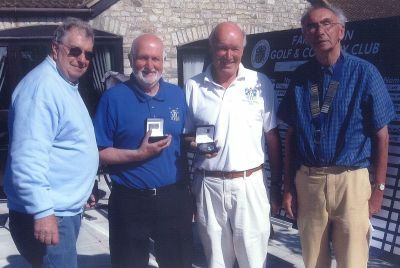 First prize went to Mike Astle & Chris Liberty, second to Bob Wright & Ron Kirkham and third to Graham March & John Eke. Photo, Lion Derek Yelling, the third place winners and Lion President Geoff. Building a better future for people with Dementia is the aim of the Alzheimer's Society. Tesco have selected this society as their charity for the year and we were pleased to help. The Alzheimer's society are aiming to collect £5 million nationally. Dementia can affect anyone, it is progressive and terminal but people can live well with the right support. We thank everyone for their support. Photo: Making a donation are the Warehouse Team Leader, Alex Kearney and Counters Manager Maria Pocock with Lions Trish, Russell and Hilton. CLADS, the Chew Lake Association of Disabled Sailors was formed nearly 20 years ago, and is an association for disabled people, who wish to sail. 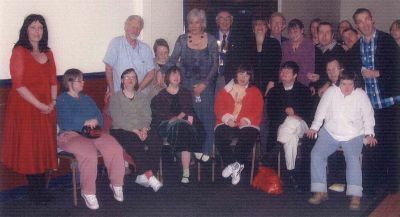 The association was started by two enthusiastic members of the main sailing club at the lake and consists of some 15 disabled members plus helpers. Some 4 years ago, we were approached by CLADS to see if we could help. This we were glad to do and in April 2008, provided CLADS with four boat covers. When we presented these, we were impressed by what CLADS was doing for their members, but were disturbed by the difficulty experienced by the disabled in getting into and out of their boats. 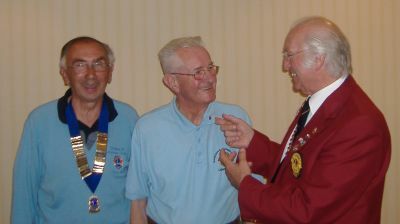 Lion Alan selected CLADS as his president’s charity for 2008-2009. As a result, we were able to help with the provision of a hoist and presented a cheque for £3000. This makes embarcation and disembarcation, a much safer and more dignified affair. It was a pleasure to see how sailing brings joy to some severely disabled people. 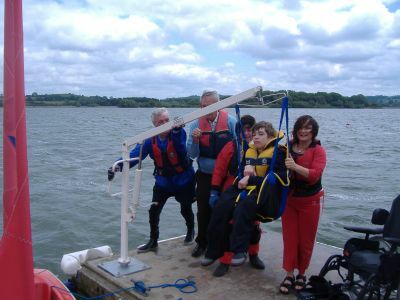 Photo: Marchant, being lifted to the boat assisted by mum Sue on the right together with other helpers. Lion Alan, second from left, is hiding behind the hoist! Marchant is severely disabled and is a 15 year old pupil at Bristol Grammar School. He is among the top 5 pupils of his year. He has been sailing for 8 years, and the enjoyment he gets from this activity is abundantly clear. The District Governor, Lion Colin Duncan official visit to our club. Following his address to the club, Lion Colin was pleased to present Lion Jack with his 30 year service award. Jack is a retired company director and secretary of C H Field Ashleigh Coaches, Paulton and a former Fire Officer at Paulton Fire Station which he served for 26 years. He has served Lions on the welfare committee for 25 years. Jack has one daughter and three grandchildren. Accepting the award, Jack said it has been a privilege to serve and will wear his badge with pride. Photo: Lion President Geoff, Lion Jack and DG Lion Colin presenting the service award. 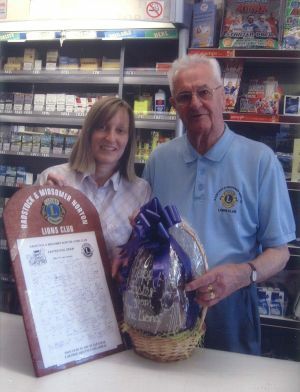 Once again the club ran its easter egg draw, with eggs being placed throughout our area. Nearly fifty delicious eggs were available with the draws taking place over the Easter weekend. Once again, the event was organised by Lion Alan and this year the proceeds are being donated to the Japanese Earthquake / Tsunami appeal. Photo: Making the draw at the Paulton News Shop is proprietor Andrea Cottle, assisted by Lion Jack. Following the successful Valentines Concert, we were pleased to present Cathy Judge with a cheque for £858 in support of the work of the Orchard Vale Trust. 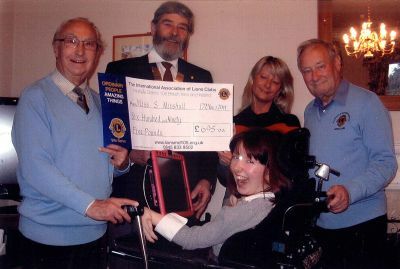 Photo: Lion Robert Briggs (organiser of the concert, Singer/Songwriter Cathy Judge, Lion President Geoff Moore assisted by one of the member of the trust. The swing band played for a dance at Coleford British Legion. Dancers enjoyed the evening, with the 16 musicians and singer reminding them of the great music of the 50’s and 60’s. Lions Club President, Geoff Moore, presented Geoff Fuller with a cheque for £100, to add to the magnificent sum of £8,500 that he has already raised for “Help the Heros” Mr. Fuller hopes to reach his target of £10,000 by the end of his year of fundraising. During the evening, a 50/50 draw raised £128, half of which went to the four lucky winners and the remaining £64, together with the proceeds of the evening, enabled the Lions to present nearly £300 to Mr. Dennis Chambers and Mrs. Moira Mallinson who received the donation on behalf of Coleford branch of British Legion. 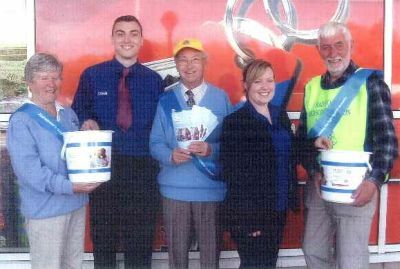 Dennis and Moira thanked the Lions for their kind donation, which will go towards helping people in the local community. 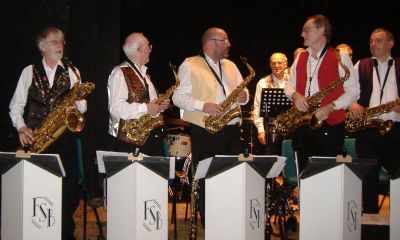 Photo: Saxophone section of the Frome Swing Band. Paulton Rovers Football Club Ballroom was filled to capacity for a concert organised by Lion Robert Briggs and his wife Margaret. Success from the start was assured by the 50 strong Village Voices group, led by soloist Jenny Pepelow. They presented us with songs from the shows and love songs for Valentine's weekend. Local poet and writer Hazel Williams gave us monologues and dittys about the local area. Singer/Songwriter Cathy Judge and her band played easy listening songs. Thanks are extended to Jenny, Village Voices, Hazel, and Cathy and her band, all for giving their services free of charge, to Paulton Rovers for giving the use of the Hall without charge and to those who gave the raffle prizes, a big thank you. The proceeds of the evening, £858, are to be given to the Orchard Vale Trust, a local charity for people with learning disabilities. 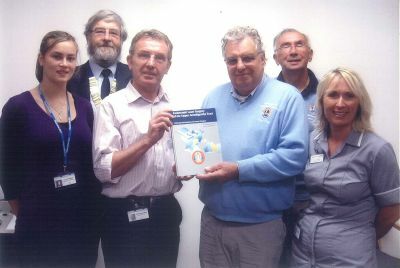 Photo: Cathy, Hazel, Lion Robert and Lion President Geoff, pose together with members of the trust. Due to inclement weather, we had to delay our Christmas Meal to January. Cameley Lodge did us proud again with an excellent meal followed by a disco. Lion Geoff had a surprise up his sleeve, when he presented a Melvin Jones Fellow award to Jean, wife of PDG Lion Alan Denham, who is now both Club Secretary and District Treasurer. 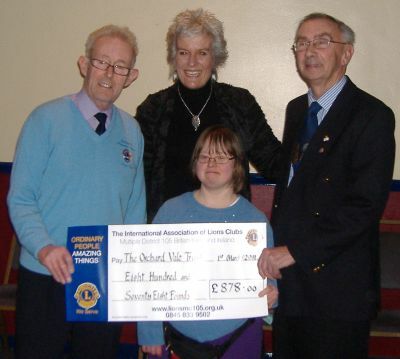 Photo: District Treasurer, Lion Alan Denham, Mrs Jean Denham and Club President Lion Geoff. We receive an enquiry from Halsall Construction, Peasdown St John, offering to help disabled people to improve their lifestye. We contacted Greenhill house, part of the Leonard Cheshire Disability organisation and Ann Chinca, Volunteer Coordinator, was pleased to accept. The £300 donated by Halsall will be used to provide fixtures and fittings for the conservatory area. We were pleased to present a certificate of appreciation to Halsall. Photo: L-R Lion President Geoff, Lorraine Zawistowski, Company Secretary, Richard Austin, Halsall Area Director, Ann Chinca and Lion Russell Ford, welfare chairman. Now it has started, it won't stop! The club was pleased to welcome its second lady member, Mrs Patricia Rowse. Patricia recently retired as a midwife of 25 years experience and has moved to High Littleton from Staffordshire. She has two sons and four grandchildren, is a keen gardener, loves playing golf and enjoys cooking and travel. With her husband Don, she is a very active person, always on the go and ready to help others, a Lions motto. We welcome the ladies who can bring in new ideas, expanding our programme and in general helping our work both locally and internationally. Patricia was introduced to the club by Lion Robert Briggs.